Christmas is over and we are on the doorstep of a brand new year. 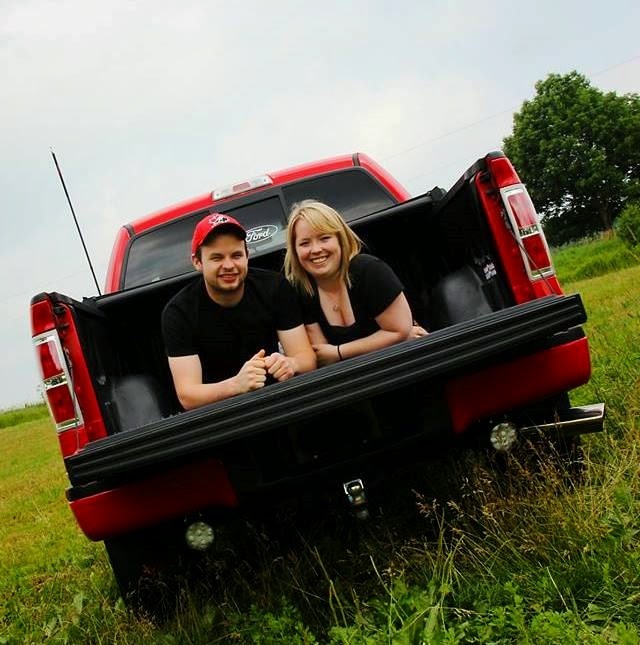 2011 was a great year for me with lots and lots to be thankful for. I wanted to do a few posts on some of the Christmas gifts that I received this year. It was one of the most 'meaningful gift' Christmas's I have had in a very long time. My friend and business partner is the person that I spend the most time with during any given week. She sees me at my best and my worst. She knows my likes and dislikes. 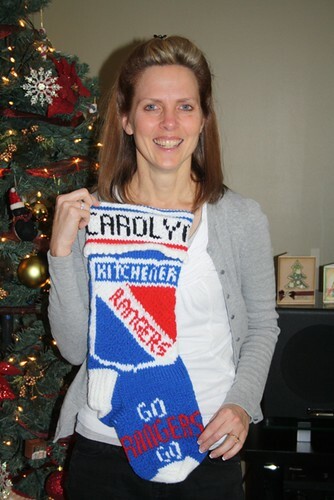 She also has to put up with my constant rambling about my favourite hockey team.....and she doesn't even like hockey. That is what makes this gift so very special. 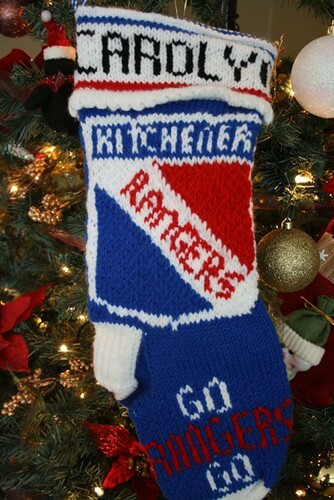 It is my very own Kitchener Rangers stocking.....with my name on it. I was in total shock when I opened it and the first thing that popped out of my mouth was 'did you make this'? She quickly told me no, but that she did have it made for me. She was at Wendy's (a local burger restaurant) and saw a similar stocking hanging there. She inquired about it and found out that someone that works there had made it. Joanne frequented the restaurant until she connected with the artist and asked her if she would make one for a gift (for me, lol)! The woman said she had never made one for anyone else before and wasn't even sure she would have the time. Joanne begged and begged. The fact that anyone would do something that nice for me makes this gift very special. I can't believe that this is my last Sketch Support layout for 2011! I have been a part of this Creative Team for 1 year and the time has flown by so quickly. I am happy to say that I have signed on for another year, so 2012 will be filled with more inspiration using these awesome sketches by Allison Davis. This week it is one-page sketch week and here is the sketch we had to work with. Here is the layout that I created using the one-page sketch. I stuck pretty close to the design with only a few little changes. I did have some fun with the hanging ornaments. I used a digital image from Whimsie Doodles and paper pieced them to create my design. 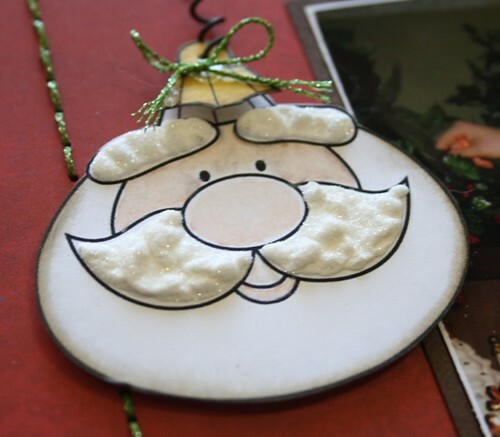 On the Santa image I added some liquid applique and glitter. Rudolph is my favourite with his big red nose. I inked the edges and added some wire to the top of each ornament too. Instead of all the small photos, I replaced them with stickers. I matted them with cardstock and kept the placement the same. I used stickers and chipboard for my title and I added some glittery thread and added the bow. I did my journaling on the computer and then cut it into strips and attached it to my layout. I hope you have enjoyed the year of sketches from Sketch Support. There is lots more to come in 2012! Christmas is in just a few days (I can't believe it)! I have finished all my shopping and even bought my groceries. Most of the gifts are wrapped and we are ready to go. 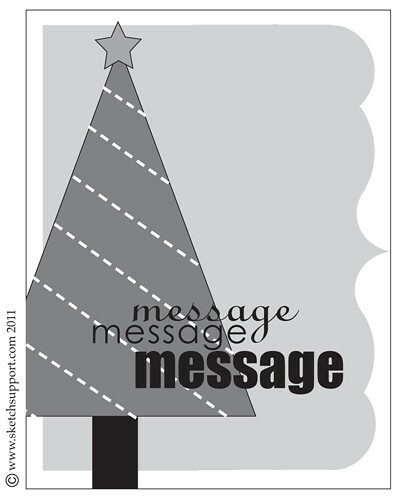 I would like to take this opportunity to wish all of my scrapbook friends a very Merry Christmas and I hope that 2012 brings you much joy and happiness! This week at Sketch Support it is add-on week. We are still keeping with the Christmas tree theme. Here is the sketch. 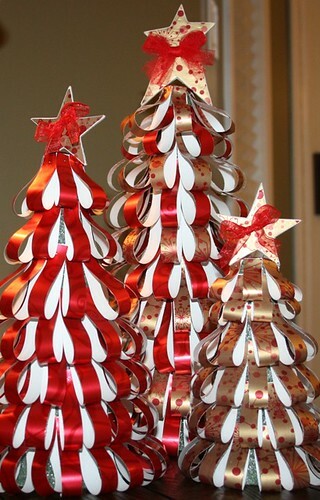 I decided to make a 3D version of this and I created 3 trees for my Christmas decor. 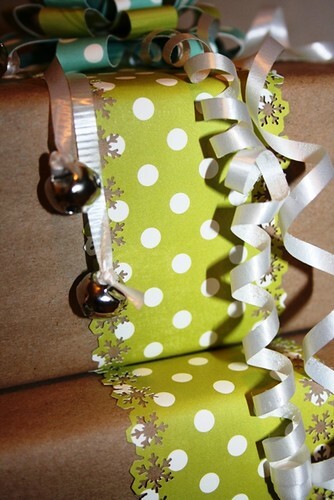 I used wrapping paper instead of scrapbook paper. There are so many pretty papers to choose from. I was a little worried that the paper was not double sided and the white showing would not look good. I actually don't mind it at all. The photos really don't do these justice. They are beautiful in my front hall. 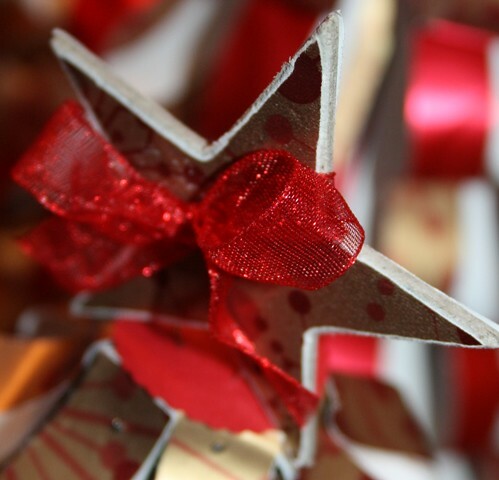 I topped them with a chipboard star that I covered with wrapping paper and added a ribbon bow. The creative team has made some really awesome projects using this sketch. Be sure to visit the Sketch Support site and check them out! 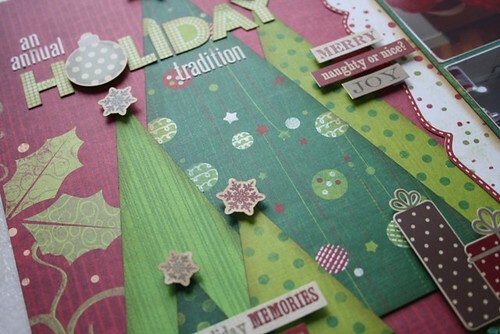 Two Scrapbook Friends Christmas Blog Hop! 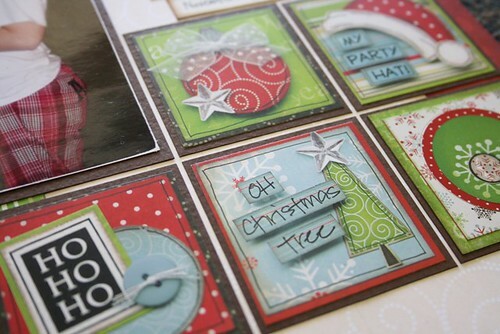 Welcome to Day 11 of the 12 Days of Christmas Creations Blog Hop with Two Scrapbook Friends! You should have arrived here from Tammy's blog. Her projects were amazing. I especially love the place card/gift tag! I have been so inspired by all the awesome things I have been seeing on websites and people's blogs for this Christmas season. Every year I make a list of all the things I want to try and I don't get around to doing many of them. 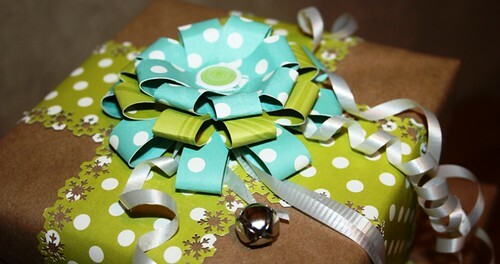 I have really been noticing how you can wrap and embellish gifts. This was something I really wanted to try. I recently accepted a design team position with The Cutting Cafe and my first cutting file was the Loopy, Loopy Bow/Flower. It was the perfect opportunity for me to make my own bows for some of my Christmas presents. I began by wrapping my boxes in kraft paper (it is actually a couple of bags from Two Scrapbook Friends....creative, huh)? I used the cutting file and cut the bow template in the small, medium and large size. I assembled them and layered them together, fastening them with a large brad I found deep in my stash! 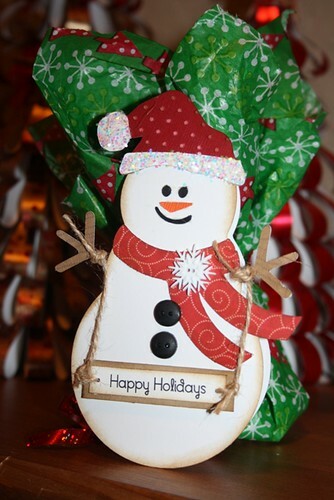 I added some curling ribbon and some jingle bells to accent the layered bow. 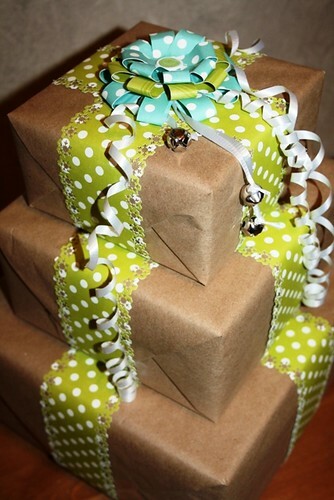 I used some 12x12 coordinating paper and created strips to tie in the rest of the gifts. 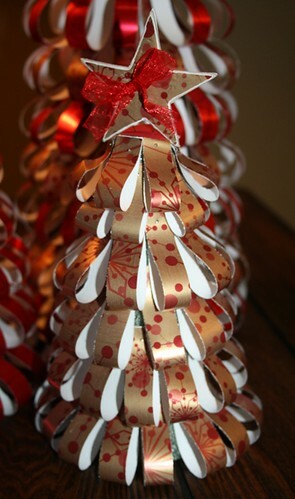 I used a Martha Stewart snowflake border punch to fancy up the edges of the strips and make them a little more festive. I hope this has inspired you to 'scrapbook' your Christmas gifts this year. Matt, my 15 year old son, told me that if he received a gift that looked like this, he would be pretty impressed. He said that if someone took all that time to make it look so good, there must be something pretty 'cool' inside. Your secret word for today is HAPPY! 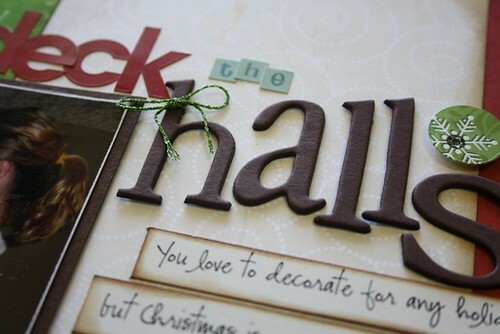 Tomorrow is the last stop on the 12 Days of Christmas Blog Hop and you will be visiting the Two Scrapbook Friends blog! Make sure that you have visited all the blogs on the hop and left a comment at each one in order to qualify for the draw for a prize. You can view the complete list here! I would like to take this opportunity to wish all my friends a very Merry Christmas! 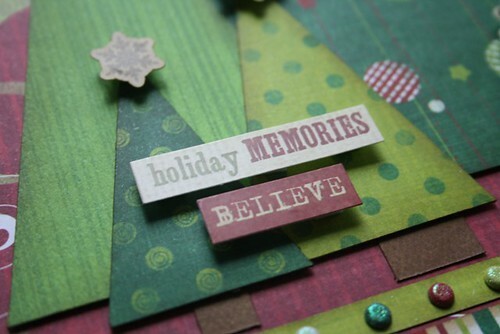 I hope you make some wonderful memories with your family and friends over the holidays! I recently decided to apply for another design team position for a company that has SVG cutting files and printable stamps! 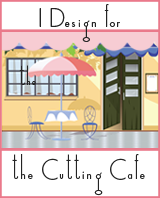 I am happy to say that I was accepted to join the team for The Cutting Cafe!!!!! Cutting files and printable stamps are a new addiction for me and I can't wait to show you some of the amazing things you can do with them. As a design team member, I am required to submit 3 projects each month, so you will get to see lots and lots of new ideas on my blog. 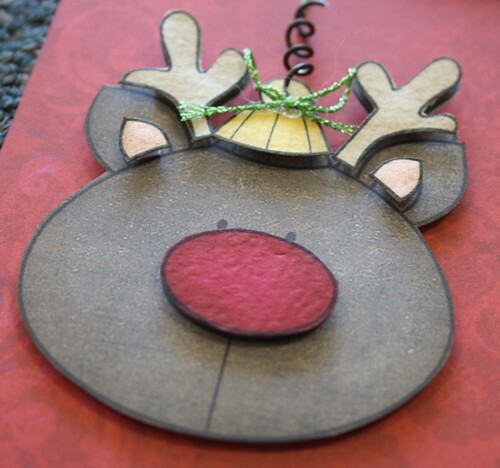 I can't wait to get started.........as a matter of fact, you can see my first project on Tuesday for the final day of the Two Scrapbook Friends 12 Days of Christmas Blog Hop!!!!! 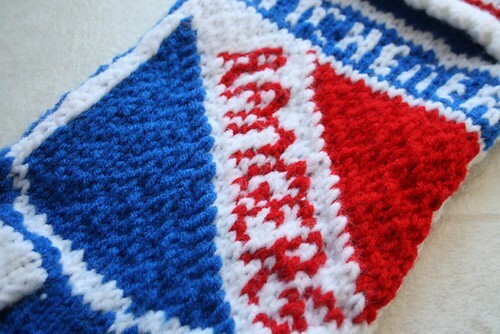 So yesterday I decided that I would make a quick card for a special friend at the Ranger game. He is only 5 years old, but we share the love of watching the Rangers play. He gives me a 'high five' every time they score a goal. 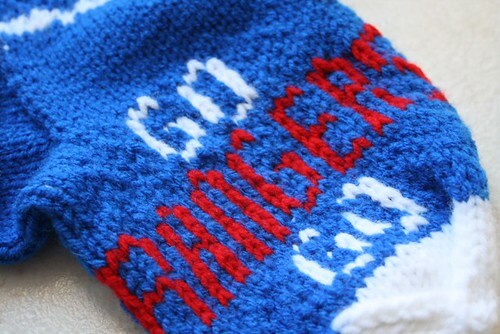 It was sort of a last minute idea and I wanted to take it to the game last night. 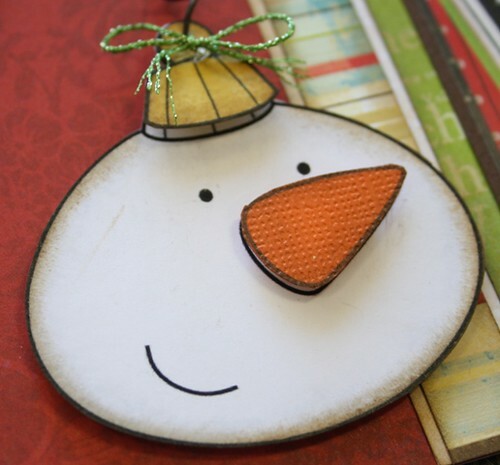 I used an SVG file from The Cutting Cafe to make this sweet snowman card. I used my Cuttlebug to emboss his hat and added some glitter to make it sparkle. I wrapped up some sweet stuff in some tissue too. He was super excited when I gave it to him. To add to that, the Rangers won in overtime and a shoot-out! It was a great night. I am back with another awesome sketch from Sketch Support. It is two-page week, which is my personal favourite. Here is the sketch that Allison created for us to play with. I am not a big fan of scrapbooking Christmas because I find that my photos are not usually the best and they are often very busy. These photos are no exception. They are from my annual shopping trip to Erie with my sister. We always go to Bath & Body Works (and spend a ton of money). Their displays are so colourful and I couldn't resist taking some photos. I didn't use one sheet of cardstock on this layout. 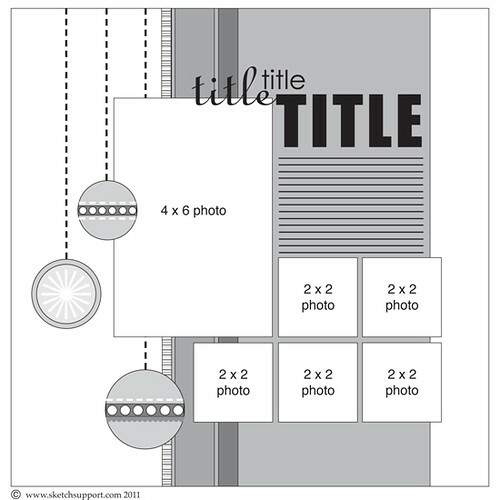 I don't think I have ever created a layout with using cardstock. 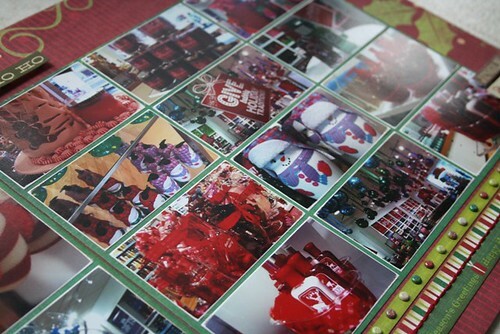 The stickers I used are from the 25 Days of Christmas from Simple Stories. There are so many stickers on the sheet, I hardly made a dent in it. I used foam adhesive to pop them up and make things a little more interesting. 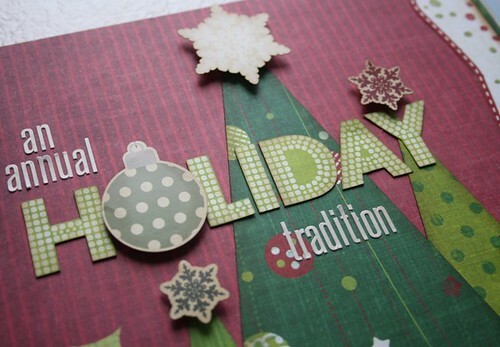 To create my title I cut out the word 'holiday' from one of the papers and added some mini alpha stickers. I love how it turned out. I had to add some of my favourites........brads and stitching. It wouldn't be 'my' layout if I didn't. I increased the number of photos from 9 to 12 on page 2 of my layout. I used Picasa to create a collage and then I printed it in an 8x10 size print. I cut the photos apart and matted them with a large piece of dark green pattern paper. 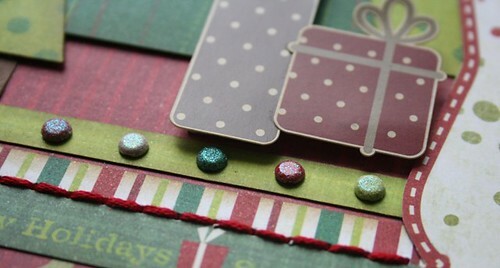 This going to be one of my favourite Christmas layouts. Maybe I have started a new trend. Thanks Allison for another amazing sketch to work with. Hey everyone! Just popping in to show you my second card for this weeks sketch over at Sketch Support. 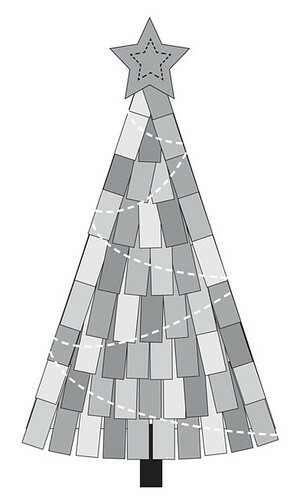 The sketch is so versatile and easy to work with. You can see it here. I even pulled out my sewing machine to create this card. Thanks for visiting my blog! 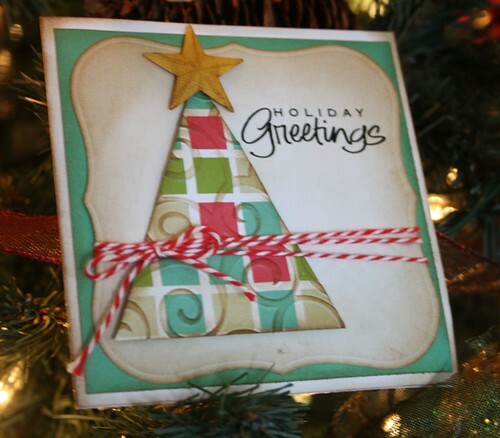 The countdown to Christmas is here and with that in mind, your friends at Two Scrapbook Friends invite you to countdown the 12 Days of Christmas Creations with them. 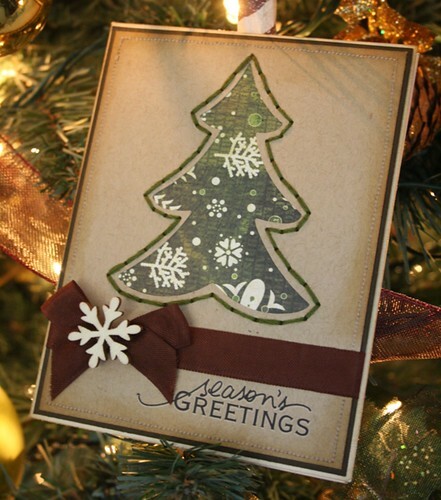 Each day a member of the Two Scrapbook Friends team and a few special friends will share with you some of the projects and inspiration that they have created to celebrate the Season. Beginning on December 10th at 8 am, you can begin the hop at the first Friend's blog where you can be inspired and leave a comment. That blog will then tell you where you need to hop to on the next day! You will need to hop from blog to blog leaving a comment on each in order to qualify to be in a draw for a special prize from Two Scrapbook Friends! Also, you will find a SECRET word on each blog which will make a special phrase at the end of the Blog Hop! Once the 12 days of hopping are complete you can email the phrase to us and we will enter you for another ballot to win! The hop will remain open from December 10th to December 22nd at midnight (EST). 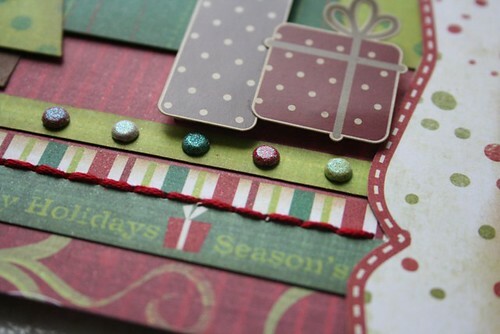 Winners will be announced on December 23rd on the Two Scrapbook Friends' blog. On Saturday, December 10th you will start the hop on Joanne's blog. You will find all your instructions there. Check out the link below! December is going to be a great month over at Sketch Support! This week is card sketch week and I made 2 cards. You can never have enough Christmas cards. Here is this weeks card sketch. If you visit the Sketch Support site you can download a copy for yourself. Here is the first card that I made. I changed it to a square card instead of the traditional size. I hit my scrap bins and made the whole card using leftovers from other projects. Be sure to visit the Sketch Support site to see what the other Creative Team members are creating. Also, stop back tomorrow and I will post the other card I created with this sketch. 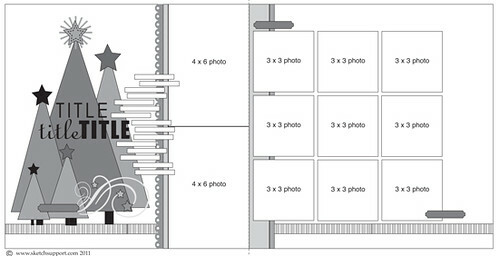 Here I am with another sneak peek of a layout that I will be showing this month. 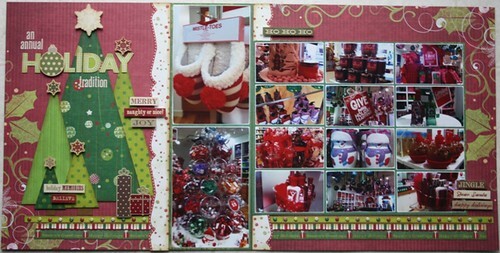 It is a 2-page layout for Sketch Support using the new We R Memory Keepers Christmas collection. 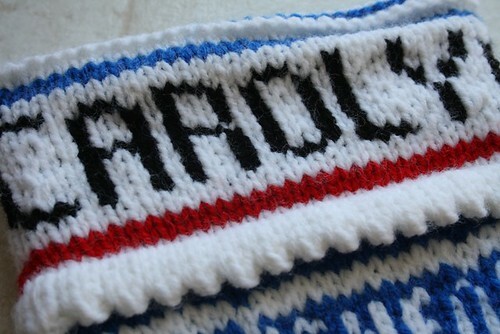 This layout is full of some of my favourite things......stitching, brads.......oh and a spectacular title. Be sure to come back and see the whole thing. This morning I woke up, like every other morning, and checked Facebook on my phone. Amanda (my 19 year old daughter) had posted in her status 'take a stand against bullying'. There was a YouTube video attached and I clicked on it. I invite you to click on it. Please do not skip this part. You need to watch this! My question is, how does someone so young get to this point. This is a real cry for help. I have watched many videos that have been sent to me that have brought me to tears, but this one really broke my heart. He is a human being, with feelings. He is someone's son, grandson! His is likely someone's brother. He is someone's friend (at least one person anyway). Why do people have to tear him down? We live in such a cruel, cruel world. This video was uploaded in August. Here we are 4 months later and I am wondering how he is doing. 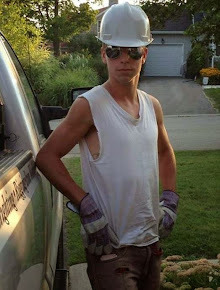 He is in grade 8. Are things better for him or is he still struggling? I will be showing this to my boys and reminding them to be kind to everyone. I am so excited to announce that I have been invited back for another year on the Sketch Support Creative Team. The last year has flown by and I can't believe we are heading into 2012 in less than a month. Carolyn Wolff ~~~that 's me! You can visit the Sketch Support site and visit the members blogs by clicking on their names. It is going to be a great year. Found this today and thought I would share it. It is so true!